Despite the best efforts of Ebay, Amazon and the rest, it’s still possible to come across unexpected finds and real bargains in good old-fashioned secondhand bookshops. Last week, I paid a call to the delightful Discovery Bookshop in Garnant, in the Amman valley – arguably an odd location for such an establishment, made even odder by the fact that its welcoming owner is Australian! There, I picked up a memoir called The Parting Mist by Harold Edgar Williams (1917-2004), a clergyman who served as a Canon of Brecon Cathedral and Archdeacon of Gower, for the bargain price of £1.50 (the most expensive copy online is £23.95!). This appealed to me for two reasons: Williams was born and raised in my home town of Llanelli, so the book begins with several chapters chronicling life there during the 1920s and 1930s, but he also served as a chaplain in the Royal Navy, and it’s that aspect of his life that I’ll summarise here. Having trained as a clergyman and served as a curate during the war years, Williams became a naval chaplain and joined the light cruiser HMS Dido at Chatham in 1946. He was not the only Welshman on board: one of the others, ‘Taffy’ Jones from Newport, was ‘the main occupant of the cells…he was of the opinion that if he made a nuisance of himself on a regular basis, they would discharge him from the Navy’. Williams recounts the nature of shipboard life, the chaplain’s duties, and the Dido‘s ports of call, which included ‘showing the flag’ visits to Morocco, Portugal, Denmark and Norway. Although a republican by inclination, Williams recounts with some pleasure the part Dido played in escorting HMS Vanguard on the first part of her cruise to South Africa in 1947, with the royal family on board. Following this first stint at sea, Williams returned to Wales to serve as a curate in Swansea. 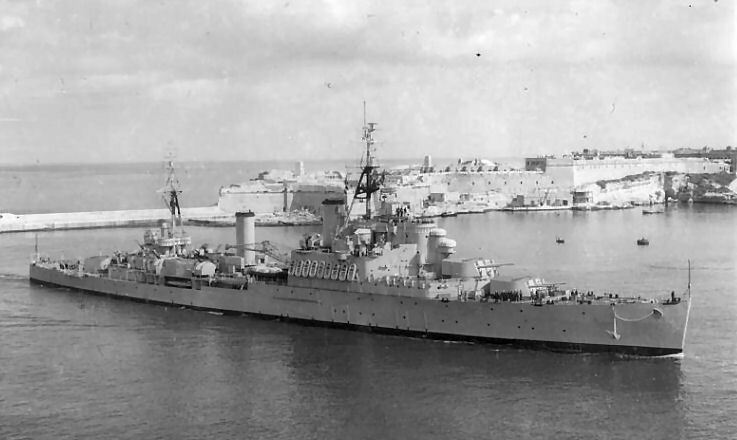 HMS Bermuda entering Grand Harbour, Malta, in 1954, when Harold Williams was serving aboard her. Some time later (Williams is very vague on dates), he served briefly as chaplain of HMS Landrail, the air station at Machrihanish, Campbeltown, and as relief chaplain of Britannia Royal Naval College, Dartmouth, when the regular incumbent was on sick leave. Williams then joined the Colony-class cruiser HMS Bermuda at Devonport before she sailed to join the Mediterranean Fleet; the book includes a photograph of him and the rest of the ship’s Welsh contingent (three other officers and nineteen men) sitting on one of the ship’s forward 6″ gun turrets. He was greatly impressed by Malta, somewhat less so by Port Said, where Bermuda served as guardship in 1954, just as the tensions which led to the subsequent ‘Suez crisis’ were increasing. Bermuda then sailed to the relief of Zante, which had been struck by an earthquake, before returning to Malta and a visit from Emperor Haile Selassie of Ethiopia. This was followed by a cruise to Venice and Naples: ‘as I looked out at the Bay of Naples, I was moved to compare it with the Swansea Bay that I knew as a young man, when the Mumbles train took us around the coast…’. Further visits were made to Trieste, Rhodes and then to Istanbul, the latter prompting recollection of ‘the account I received from my parents of the loss of a whole regiment of Llanelli soldiers at Gallipoli during the first world war’. Williams provides extensive descriptions of all these destinations, particularly of the churches and mosques, and the religious services conducted within them: ‘as I listened to the Imam lead the faithful in prayer within the Mosque, as a true Welshman, I appreciated the rhythms as the Koran was read, described in the words of one Arabic scholar as that “inimitable symphony”, not unlike our Welsh hwyl‘. Subsequent port visits included Beirut and Piraeus, with excursions to Damascus and Athens respectively. On Bermuda’s return to Britain (c.1957?) Williams left the Royal Navy and returned to parish duties in south Wales. Bermuda herself ended her days not far from the likes of Llanelli and Mumbles, being broken up at Briton Ferry in 1965. All in all, Williams’ memoir provides an interesting insight into the often neglected role of the naval chaplain, and was certainly well worth £1.50! This entry was posted in Uncategorized, Welsh naval history and tagged Chaplains, HMS Bermuda, HMS Dido on June 29, 2015 by J D Davies.